The Dunes of Tinfo have long been referred to as the “Healing Dunes of the Sahara.” Travel to Morocco’s Sahara Desert and have a first hand experience within the sacred Dunes of Tinfo. Let your guide bury you in the Sahara Desert sand from head to toe. Being buried in sand dunes is known to assist in healing ofrheumatoid arthritis and to calm the spirit. The Dunes of Tinfo reside within the town of Zagora, Morocco. Zagora is a Saharan desert town in the Southern Draa Valley. Travelers to Morocco and Moroccans for their healing qualities favor Zagora and the Dunes of Tinfo. The Zagora region and its Draa Valley boast 45+ qualities of dates. Zagora, Morocco and the Dunes of Tinfo also lay claim to some of the best Moroccan sunsets and Hollywood mountain scenery. To reach Zagora it is best to start your Morocco vacation in the region of Ouarzazate, Morocco and then journey with a Travel Exploration driver in a 4×4 land cruiser for 2 hours through the Draa Valley or by pise (windy desert road). The road to Zagora by pise and through the Draa Valley will enable Moroccan travelers to discover the old Moroccan caravan routes where donkeys, camels and mules once transported sugar, tea, dates and other dry goods from the Sahara, through the Draa Valley to Ouarzazate and onto Marrakech, Morocco. Zagora was originally called ‘Tazagourt’ the singular of plural ‘Tizigirt’, Berber for ‘twin peaks’, referring to the form of the mountain. In old European maps of Morocco the mountain Zagora is shown but the town is not since Zagora was built in the 20th century. On the top of the Zagora Mountain the remains of an Almoravid fortress can still be visited during your Morocco Sahara vacation. Each year the moussem (festival) of the Sufi saint moulay Abd-el-Kader Jilali is celebrated at Zagora. 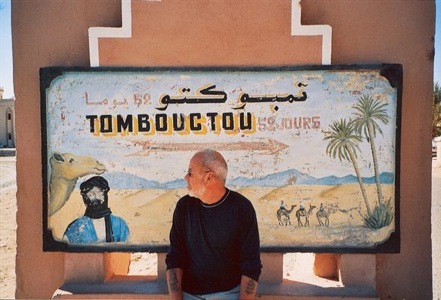 One of Zagora’s highlights is famous road sign to Timbuktu that reads “52 jours” – 52 days by camel to Timbuktu. The town has recently had a new “52 Days to Timbuktu “ sign painted and posted however the old one still remains. In Zagora you can walk the palmaryand hamlet set amid lemon, almondand olive trees, and gardens of thevillage of Amazrou and also visit Zagora’s unique, beautifully glazed forest green pottery at the local cooperative in the desert town ofTamagroute. 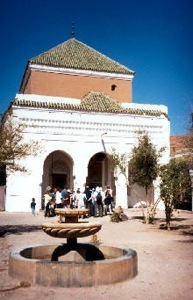 One of the most fascinating places is the Koranic library and the Spiritual Zaouia site. For those travelers who want more, Zagora lays claim to some of the most beautiful carpet shops where you can find traditional Berber Moroccan carpets, hand woven that are old at incredible prices. When you travel to Morocco and camel trek in the Zagora’ Sahara you can also spend the night in a traditional biouvac, have dinner at sunset and then dine by the stars near the dunes or a Desert Oasis. A Sahara Camel Trek is a must when traveling to the Moroccan Desert. Come Travel to Morocco With Us. You are currently browsing the archives for the Morocco Zagora Travel category.